Are you working on or behind the screen in a production that showcases Asian Australian talent and/or want to send in a greeting to Asian Australian colleagues and emerging members of this creative community? 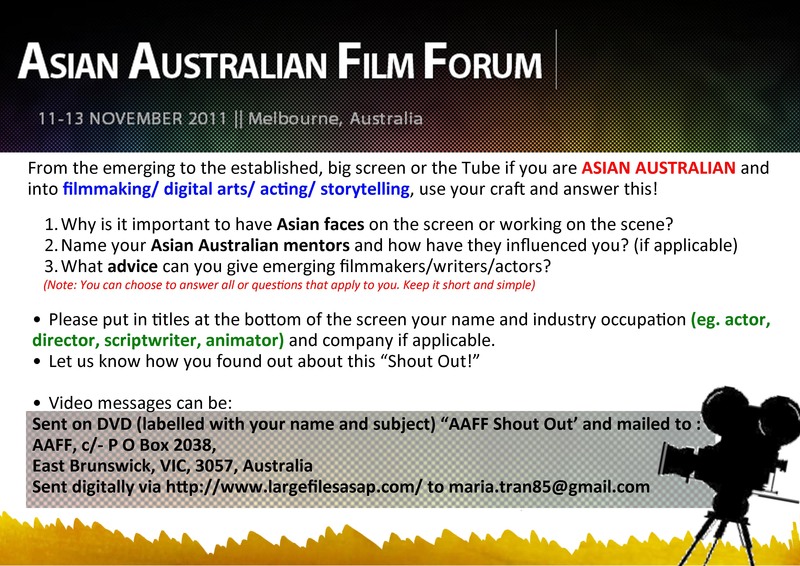 The AAFF organisers wish to highlight and facilitate the positive influence that both leading figures and emerging talent in the Asian Australian community and its supporters have on those wishing to develop a voice, tell their stories, and make an impact in the mediums of film, video, and television. Video messages can also be saved on DVD and mailed to the AAFF, c/- P O Box 2038, East Brunswick, VIC, 3057, Australia. Please label your DVD with your name and the subject ‘AAFF Shout Out’. Those selected will be featured at the launch event of the AAFF, and may also be used in its promotional trailer and on its website. Shout Out Project Co-Ordinator: Maria Tran (assisted by Amadeo Marquez-Perez and Indigo Willing). Posted on 14/09/2011, in Uncategorized. Bookmark the permalink. Leave a comment.